Over time you may have come across many blogs that creating lists of “How to many money online” or “Follow these ten tips to a profitable blog”? Yes, there are many different ways to make money blogging and many of them require plenty of upfront work gaining the traffic and readers to generate traffic to your website or blog. After you get a blog setup there are many ways to get paid for blogging. 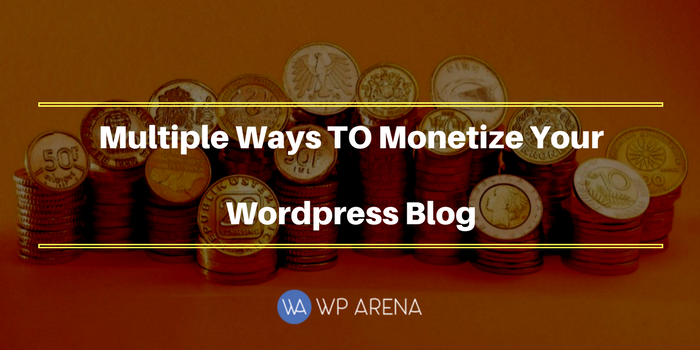 Today’s blog post will mention a lot of ways to Monetize Your WordPress blog. Keep in mind; some may not suit the type of blog that you are running and some will. So take your time and go check out each recommendation. You can apparently see that on this blog I use several different methods to make some money. The first thing most people do is place AdSense or sponsored ads on their blog and I also show some of the multi-level marketing programs I belong to and promote. A tip is to try not to monetize your blog as soon as you create it. It does no good when you have no steady traffic. Once traffic starts to pick up, then slowly introducing some ways you plan to make money from your blog. By easing these methods on, it won’t be a huge shock to your loyal visitors. Always test out multiple methods because some ways to earn online work for some people and some will not. Google AdSense is the most popular way to make money online as it’s typically easy to get your blog approved. Ensure that you have a lot of blog post on the blog before applying. That’s the secret to getting accepted. Here is an easy way of installing Adsense on your WordPress site. Also, read this Google Adsense Checklist before applying. Here is a great list of WordPress Adsense Themes to help you boost your earnings instantly. Besides Google AdSense, there are other ad networks to consider if Google AdSense rejects your blog. Some of these websites before have minimum traffic requirements to apply so read their rules before joining so you can not waste time registering. After careful thinking, here is what I am recommending to use as an ad network to display ads on your blog in which you earn money per click. Selling advertising space is a great way to make money each month or week. It depends on the terms you select for people buying advertising space on your blog. When you get a good amount of traffic and popularity of your blog, do what all bloggers do, they create an Advertise with us page to list how to buy an advertisement. Look in our sidebar for an obvious example. The more traffic you get, the better you can charge. When I buy advertising space, I ask the blog owner for Google analytic stats because I want to see how much different traffic they get. I don’t want to pay a high fee, and the blog get’s not a lot of traffic. My investment would not work in my favor. The key is traffic, a lot of traffic means most of the time the buyer will be any fee you set. Below are some networks to use to sell ads right on your blog. Affiliate marketing is the most popular way to earn money online with little effort. To summarize this up. You register for an affiliate program, grab the affiliate text link or banner image and add that to your blog post or sidebar. If someone clicks on that link and buys that product, you get a certain percentage of their total sale price. Some affiliate programs are residual affiliate programs meaning you can earn a recurring commission each month or yearly if it’s an annual membership that you was promoting. This is a very profitable method to use as the more people you recruit, the more money you make. Sponsored review posts is a way most bloggers earn money for providing a detailed review of a product or a company in which includes sharing positive and negative thoughts. The company or product owner is paying you to review their stuff, so you will be honest when trying the product out and write an honest review. These blog posts are so common that you can never tell that when you are reading a blog post somewhere that it’s a sponsored review. You can also blog for money by writing reviews about an advertiser’s service or website on your blog and getting paid to do it. Having a huge follower base and high traffic is when you should offer sponsored reviews and don’t wait for them to come your way, contact companies products that you have used before or you think your visitors will like. Make a sales pitch to them, if they bite, as for a free account so you can do a proper review. We also accept Sponsored Post reviews on this blog and please get in touch with me if interested. A few blogs that I am subscribed to have a premium membership to see certain parts of their blog or access training material..etc. They charge a fee to access this “premium content”. This is an excellent way to earn money on your blog. – Teaching a course on how to get approved Google AdSense account, keyword looks up, where to place the ads, how to increase earnings..etc. Make it a serious of videos or blog posts and then in between respond to comments and help each person one by one to achieve success. By doing this, they will certainly subscribe to the next training serious you create. I can think of many ways how to use a membership plugin to make money off a WordPress blog. Visit Moz.com for example. You get excellent advice as a free member, but if you are serious about knowing SEO and making your blog ranking, it’s worth to upgrade your account to get all kinds of goodies. I have a few friends who make a living from buying and selling WordPress blogs. They mastered the science of this, but I have never got into this method as it’s a long-term thing. First, you look for blogs that you know have potential to be a great blog with a little work on your part. Look at blogs on flippa.com. If you are an expert in SEO and have some web development experience then this method will work for you. Buy upcoming blogs, do the SEO changes on it, so the SEO is correctly done, tweak the current theme to make it a lot better and more appealing. Publish content on the blog or hire a writer to do this to get quality blog posts. Put up AdSense to earn money from it. In a few months when you are earning a decent income with top rankings, sell the blog for at least double what you paid for it or more. I have not got into this but this is a general idea what my friend does, he builds the blog up as it has more value when he is done with it. Believe it or not, adding a PayPal donate button can tend to get people to donate a few dollars to you. Let’s say you run a non-profit blog and the blog is operating costs are paid for by donations, and remaining donations are sent to a particular charity. In a nutshell, this is how charity’s work, they give your donations to the cause they are for. If you are a theme developer or a plugin developer, add a donate button to your blog because when you release free themes and free plugins, you don’t get paid for your developing time so people should donate something to give thanks for not charging money for the plugin. Notice for a lot of WordPress plugins some authors mention to donate? If you are good at doing something online, let’s say such as install WordPress blogs and set up the basic essential plugins for best performance then offer up a service for a specific fee. If you can design logos, offer your services by creating a page explaining what you offer and how to get in touch for more information. Look at our services page for a good example. Have you heard the term “The Money is in the list” before? It’s true, over time as you get to know more about how to operate a newsletter you will soon find out that it’s a money-maker with a huge list or a way to drive traffic to 1 blog topic with a mass email. There are many ways to use an email list. We talk about a few on this blog already. I’d like to share a few email subscriber business’s that work well with WordPress. This blog post was to be a beginners guide for earning revenue from blogging. As you learn more and more about blogging, there are endless ways to make money from it. This list is a continuous work in progress. So check back every so often for new methods. If you have any questions, I am more than happy to answer them in the comment section below.